The first Capcom 2D fighting game to blend characters from various series. 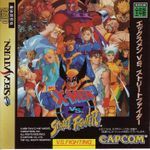 Featuring 17 playable characters (Ryu, Ken, Cyclops, Wolverine, Chun-Li, Nash, Storm, Gambit, Vega, Dhalsim, Magneto, Juggernaut, Zangief, Cammy, Sabretooth, Rogue and Gouki)the game also introduced the concept of tag team fighting. Needs the 4MB cartridge add on to play properly.